Today is the Feast of the Birth of Saint John the Baptist. I was ordained priest 15 years ago on this day [24 June 2001], and ordained deacon 16 years ago tomorrow [25 June 2000]. 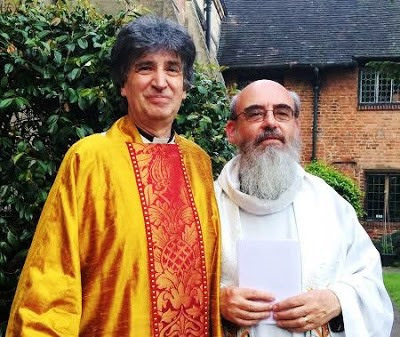 Last year, it was a particular pleasure to have been invited by the then Master of Saint John’s Hospital, Lichfield, Canon Andrew Gorham, to preach at the Festal Eucharist in the Chapel of Saint John’s on this day [24 June 2015]. I recalled that evening how my path to ordination began in that chapel when I was a 19-year-old, 45 years ago, back in the summer of 1971. Frankly, I was more interested in an evening’s entertainment when I stumbled in tat chapel out of curiosity. Not because I wanted to see the inside of the chapel, but because I was attracted by the architectural curiosity of the outside of the building facing onto the street. I still remember lifting the latch, and stepping down into the chapel. It was 13 years before John Piper’s window had been installed in 1984. But as I turned towards the lectern, I was filled in one rush with the sensation of the light and the love of God. This is not a normal experience for a 19-year-old … certainly not for one who was focussing on an active social night later on, or on rugby and cricket in the weekend ahead. But it is was – still is – a real and gripping moment. I have talked about this as my “self-defining moment in life.” It still remains as a lived, living moment. But my first reaction was to make my way from here down John Street, up Bird Street and Beacon Street and into the Cathedral. There I slipped into the choir stalls, just in time for Choral Evensong. It was a tranquil and an exhilarating experience, all at once. But as I was leaving, a residentiary canon shook my hand. I think it was Canon John Yates (1925-1980), then the Principal of Lichfield Theological College (1966-1972). He amusingly asked me whether a young man like me had decided to start going back to church because I was thinking of ordination. However, I took the scenic route to ordination. I was inspired by the story of Gonville ffrench-Beytagh (1912-1991), which was beginning to unfold at the time. He was then Dean of Saint Mary’s, Johannesburg, and facing trial when he opened his doors to black protesters who were being rhino-whipped by South African apartheid police on the steps of his cathedral. While I was working as a journalist, I also completed my degrees in theology. In the back of my mind, that startling choice I was confronted with after evensong in Lichfield Cathedral was gnawing away in the back of my mind. I return regularly to Lichfield throughout the year – most recently on 5-6 June – and I slip into that chapel quietly when I get off the train. The chapel has remained my spiritual home. I had started coming to Lichfield as a teenager because of family connections with the area. But now I claim it for myself. The traditions of the chapel subtly grew on me and became my own personal form of Anglicanism; the liturgical traditions of the cathedral nurtured my own liturgical spirituality. I now know that the evening sun does not fill this chapel with light. That Thursday evening was many years before the John Piper window was installed. But there is no West Window, look around you, this chapel is not filled with evening light, even on summer evenings. Yet that moment is a lived and living moment … not only in my memory but in my every day, all through my life. Readings: Isaiah 40: 1-11; Psalm 85: 7-13; Acts 13: 14b-26 or Galatians 3: 23-29; Luke 1: 57-66, 80.